The tools that used to exclusively belong to large organizations are now in the hands of the people, YOU. There are many social media tools available. But don't ever forget that it's about PEOPLE. People want to talk to other people, they want to talk to you. Social media allows you to create relationships with other people that you know, people that you don't know, and people who have the same interests as you. It's about building a community of PEOPLE. Being part of a community also involves giving back and sharing. You follow and get know people because you find them valuable. Give them a reason to find you valuable and they will talk to you. Social media gives you that opportunity to expand your network and be part of multiple communities. There is only one reason why people will follow you on twitter or become a fan on facebook: you have something valuable to share. Beyond getting them to start following you, people have to have an incentive to keep following. Never JUST talk about yourself (i.e. advertising). Ads are an interruption to what you are doing (watching TV, looking at the road, etc.). Instead of only pushing things out, you should also try to pull people in with news, resources, and thought provoking discussions. Choose the community/network that you're going to talk to and focus on how you will be part of that community. Have a purpose and distill it in your work. Communications in social media is a conversation: somebody talks and somebody listens. Just like any other conversation, you will listen to both the good and the bad. Do not be afraid of the bad, use it as an opportunity to hear feedback. Be prepared to act and show it. Failure to do so can tarnish your reputation, while success can improve it many times over. People, guests, or customers love being kept in the loop. If you do decide to use social media, try to be transparent about a lot of things. Let people know how you handle bad feedback, what your organization actually does, how do you go about it, and who works for you. Not to say that everything should be public but don't make it look like you're hiding something. Be honest. Some companies are open on who's managing their profiles while others actually let their staff be the entry point into their company. Nobody really knows what works and what doesn't. No social media strategy is 100% successful. Don't be afraid to try things out but if they don't succeed then move on. Notice that there are millions of videos on youtube and twice as much blogs out there. 1 Yet only a handful ever become famous. See what others are doing and learn from them. Not everything will work but you'll never know until you try. It's all about it! Creating a culture of customer-focused service. Take some time to think and reflect if using social media is right for you. If you do decide to wade in the waters, plan your strategy well. Avoid being part of the noise. Be prepared for both success and failure. Did you notice that the “Web 2.0” term was outdated? One can say that after months (years?) of overselling the “2.0”” stuff, it begins to fade. Now, modern marketers talks about “Social Media“. Because with always newer services, always more sophisticated concepts, copycat, mashups of mashups… it really begins to be confusing. This is why it was important to divide this big “ratatouille 2.0” into smaller meta-concepts to ease the understanding (Enterprise 2.0, Social Shopping, Social Medias…). But have we taken the time to define what social media is? This is my point: to provide you with a definition and give an overview of what it relates to. Let’s publish, share and sociabilize! 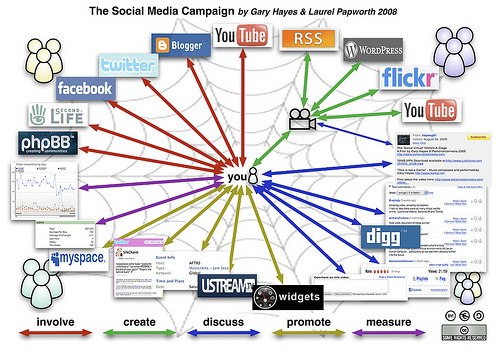 In “Social Media” there is “Media“, which means that social media are digital places for publication. 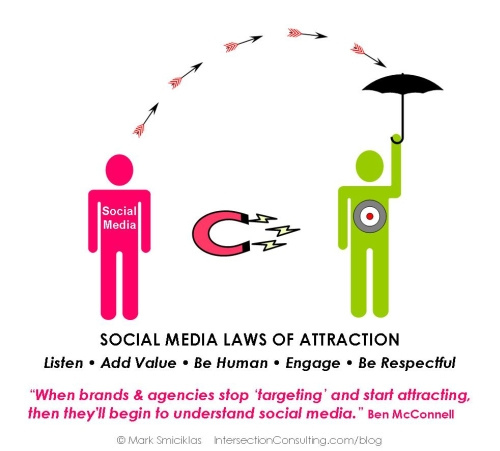 In “Social Media” there is “Social“, which implies sharing (files, tastes, opinions…) but also social interactions (individuals gathering into groups, individual acquiring notoriety and influence…). The main characteristic of social media is audience fragmentation: sources (hundreds of millions of blogs, wikis, forums…) as well as tools. Wow, that’s a lot of services to try! Now that the frame is set, it is time to analyze this phenomenon and to try to envision what will comes next. 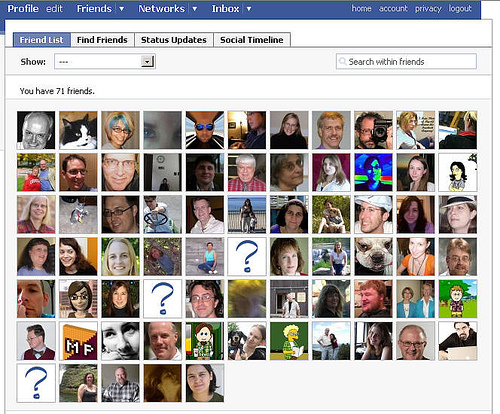 Online communities didn’t wait for Facebook to gather and sociabilize within online forums. Bear in mind that a tool in itself is not able to create a community, only members can. Or to be more precise: the capacity of members to find new subjects and interaction modes. So yes, Facebook is (still) hype, but history has shown us that audience can easily move from one service to another (remember Friendster?). Even if audience metrics show supremacy from large platform like MySpace, Facebook or evenCyworld in South Korea, global services which embrace multiple meta-functions (publishing, sharing, social networking…) are exposing their members to information overflow. So even if audience is dominated by big players, niche players are growing fast. Whether you want it or not, conversations occur with or without you. What you have to understand is that it is highly illusionary to think you can control your brand by restricting blog usage from your employee or by avoiding social networks. Your brand does not belong to you anymore, it only exist in customers’ mind, which are massively present in blogs, forums, wikis, social networks… So you have to choose between suffering and benefiting from online conversations. That is why it is important to name a social media champion within your organization (just choose the right job title: Community planner, Social media manager, Community architect, Social analytics expert…). Getting closer from your customers / prospects is a nice objective, but you first have to figure out which customers / prospects you want to be closer to. So you will quickly be in need toevaluate the real potential of those various nanomedia. This evaluation has to rely on dedicate metrics which are tailored to the constraints and specificity of social media. Furthermore, if you wish to touch opinion leaders (influencers), you will have to qualify them in order to identify those with the more potential. This is where social metrics are relevant. Do not panic, we are only beginning to observe the rise of social media (and there conquest by marketers). There is stile a lot of territories to conquer for the most audacious of you. Bear in mind that social media consumers are indulgent with creative initiatives. This is it. Let me remind you once again that you do not engage too much responsibility by experimenting new social campaigns (except for bugs attack). Bear in mind that social media is all about conversations and guess what: you can / should / have to be part of them.